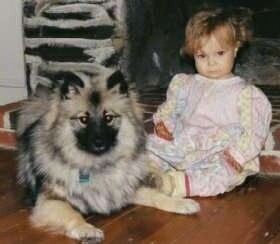 The Keeshond is a compact little animal with a strong resemblance to its ancestor, the Samoyed. Its eyes are medium sized and dark in color. The ears are erect, triangular in shape and set high on the head. The tail is medium in length and carried over the back. The muzzle is medium in length and well-proportioned to the skull. The feet are catlike, compact and well rounded. The dog has both a long, straight, harsh outer coat, which comes in shades of gray with black tips and a thick, downy undercoat, which is cream or pale gray. The coat stands away from the body. 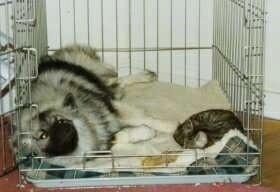 An excellent children's companion, active, intelligent, very keen and outgoing, Keeshonden are full of personality. They can be trained to perform. 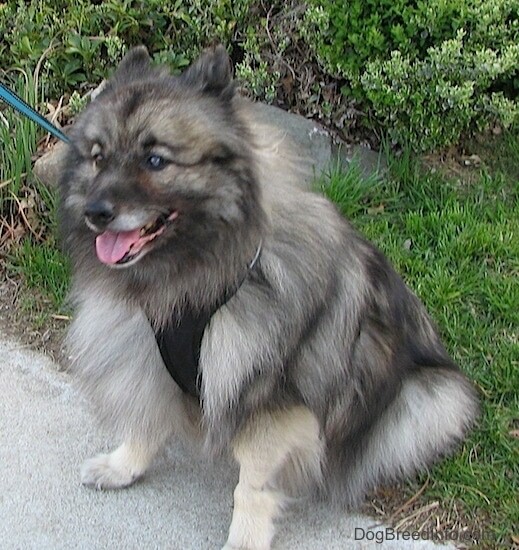 Affectionate and friendly, the Keeshond loves everyone and needs to be part of the family activities. This breed is a real character that is quick to learn if its owners are consistent. It should be trained using gentle, but firm, calm leadership. 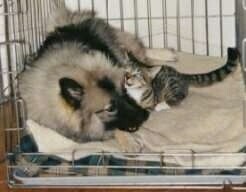 It is generally good with other pets. Socialize well to avoid them from becoming reserved or timid. Keeshonden like to bark and are good watchdogs because of their notable gift for warning of danger. Teach them enough is enough, to stop barking after their first initial warning bark. 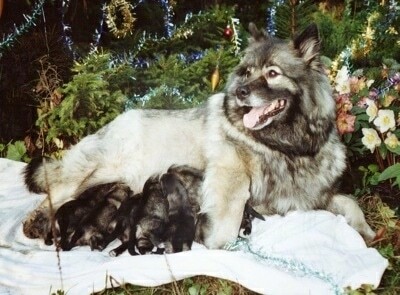 Beware of overfeeding, for the Keeshond will gain weight easily. Be sure to take them for a daily pack walk to drain both mental and physical energy, to avoid over-excitability, such as spinning in circles and other behavior issues. 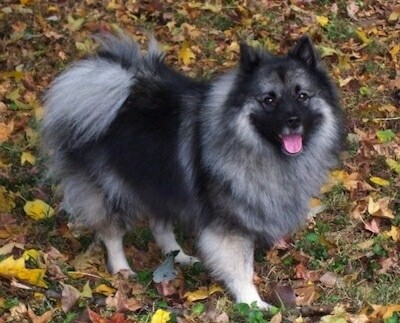 A Keeshond that spins in circles has excess energy he needs to burn, both physical and mental. Always be your dog’s pack leader, remaining firm, confident and consistent. Give the dog rules he must follow and limits to what he is and is not allowed to do. Dogs crave, and instinctually need, this type of order in their lives. Height: Males 17 - 19 inches (44 - 48 cm) Females are 10% less. Weight: some sources say 55 - 66 pounds (25 - 30kg), while others say 35 - 45 pounds (15 - 20 kg). Ask your breeder which standard they follow. Prone to hip dysplasia, skin problems and heart disease. In some Keeshonden that have unsound stifles, very demanding exercise will cause trick knee to develop. Will be okay in an apartment, although they should at least have an average-sized yard. Keeshonden prefer cool climates; they cannot withstand the heat well due to their thick coats. This breed needs to be taken on a daily walk. In addition, they will also enjoy good run in a safe, open field each day. 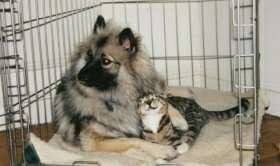 This breed is fairly active indoors. 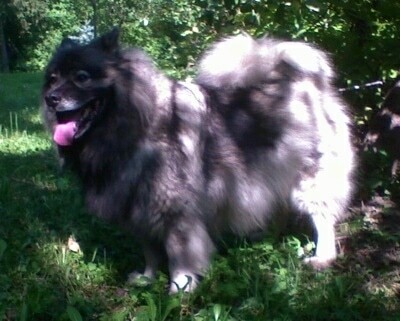 When a Keeshond spins in circles it is a sign he needs more stimulating exercise. 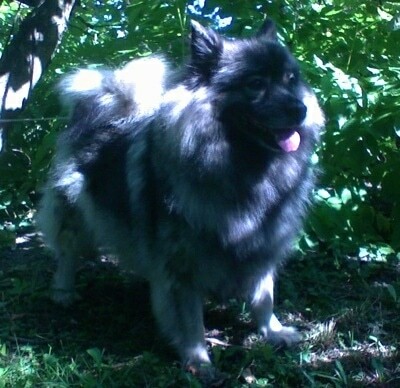 See video clip of an excited Keeshond spinning in circles. Grooming is not as troublesome as you might expect, but daily brushing of the long coat with a stiff bristle brush is important. Brush with the grain first, then lift the hair with a comb, against the grain, and lay it back in place. Bathe or dry shampoo only when necessary. The dense undercoat is shed heavily twice a year in spring and fall. 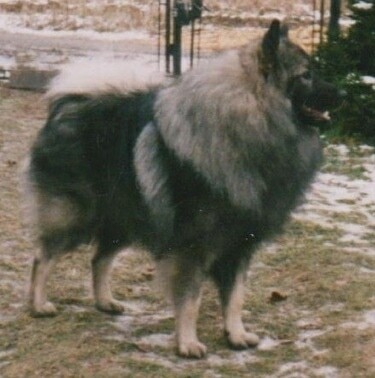 The Keeshond has an arctic origin. 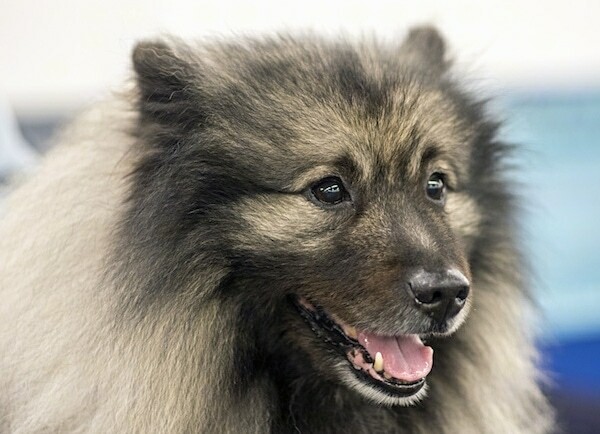 In the eighteenth century the Keeshond was known as "a dog of the people." In its veins runs the blood of the Samoyed, Chow Chow, Finnish Spitz, Norwegian Elkhound, and Pomeranian. At the beginning of the French Revolution, it became the symbol of the Dutch Patriot political party, led by the patriot Kees de Gyselaer. Gyselaer owned a dog named Kees, which gave the breed its name. The breed then suffered a long period of neglect. They were first introduced into the UK by Mrs. Wingfield-Digby and did not become popular again until 1920, when it arrived in the US. It became known as the Dutch Barge Dog, as it worked as a watch and guard dog on riverboats, barges and on farms. 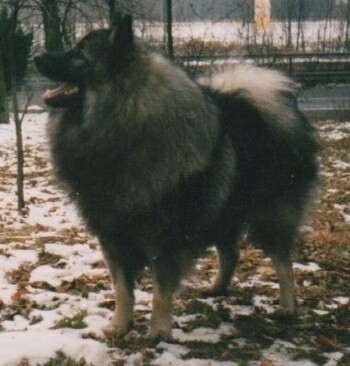 The Keeshond was recognized by the AKC in 1930. 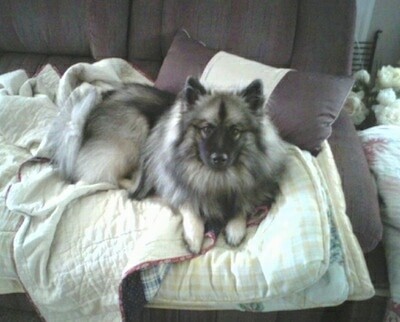 "This is a picture of my 5-year-old Keeshond, Remy. He loves to play fetch, swim and go on long walks. He loves to be around people and other dogs. They are happiest as inside dogs and don't like to be apart from their owners for very long. Mine is fine during the workday but hates to be left out of any of the action if I am home. Mine isn't that great with small children as he jumps on them but he was not raised around them, nor has he ever spent more than a few minutes with them. With kids over 5, he is very well behaved." "They are smart, strong-willed, and stubborn dogs but if you make training fun for them and follow the Dog Whisperer's advice, they can usually learn a trick or command in just a few minutes. I brush my dog twice a week and he still sheds a lot. I live in a warm climate though, so most probably won't shed year-round like mine. We do not shave him as he is sensitive to sun and can burn easily. A baby pool in the backyard is all it takes to keep my Keeshond happy for hours in the Alabama summers. The grooming is worth it since you will have the best-looking dog out of any of your friends and this really is the best dog I have ever owned." "This is Dutch at 10 months old. 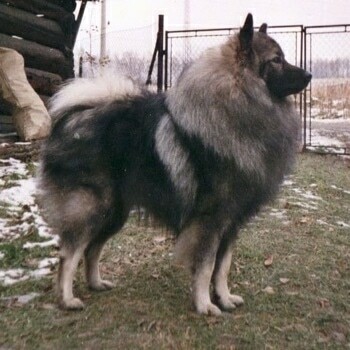 He is a full-bred Keeshond. He loves people and other animals. He enjoys watching Dog Whisperer with me (I am watching it right now, actually). He won 3rd place in a "cutest pet" contest last spring. He loves car rides and will do anything for cheese." 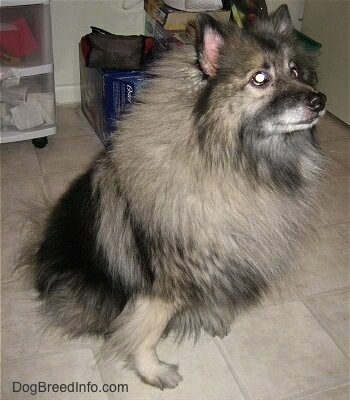 "This is Sadie, my 12-year-old Keeshond in her summer puppy cut. Sadie gets very hot, uncomfortable and miserable in the hot summer months. This year we decided to give her a shave and she is extremely happy, not to mention adorable! We did not shave her to her skin and did not have to worry about sunburn. Her hair grew back nicely by fall."